Loeffler Boiler Model - Heat Transfer Training Systems and Heat Lab Engine Trainers for engineering schools. Properly constructed non working model made of wooden and metallic parts. Showing necessary parts such as Economiser, press Convection, Super heater, Steam Outlet, Radian Super Heater, feed pump and circulatory Pump etc. Overall size about 50 x 20 x 70 cm. We are leading manufacturers, suppliers & exporters of Loeffler Boiler Model - Heat Transfer Training Systems and Heat Lab Engine Trainers for engineering schools. 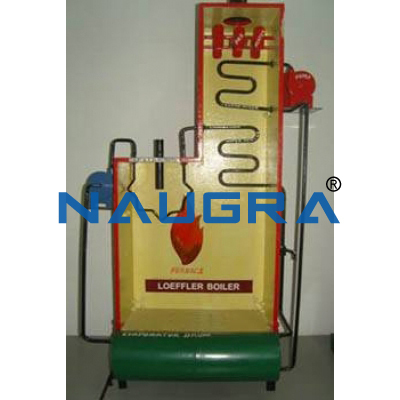 Contact us to get high quality designed Loeffler Boiler Model - Heat Transfer Training Systems and Heat Lab Engine Trainers for engineering schools for schools, colleges, universities, research labs, laboratories and various industries. We accept bulk orders for government tenders in all countries around the globe. For similar products visit at main page of Heat Transfer Training Systems.